Don't miss Practical Caravan's Elddis Buccaneer Clipper review, because this range-topping twin-single-bed has a surprise in store — its beds sit sideways! Luxury doesn't come cheap, but at least with Buccaneer you get a lot of it for your money. Representing the premium brand of Consett-based volume manufacturer Elddis, Buccaneer caravans have been turning heads on sites for years, offering buyers upmarket, tasteful interiors and spec that leaves little to want for. The four-berth Clipper gets a significant change for the 2016 caravan season – the rear twin single beds have been rotated through 90° so they’re now arranged transversely. And, in common with the other island bed models in the range (Cutter, Cruiser and Caravel), they’re retractable. This gives the bedroom an impressive amount of space, to complement a roomy parallel lounge, fully equipped kitchen and refined end washroom. And to see other Buccaneer caravans for sale, click here. Like its siblings in the Buccaneer collection, the Clipper runs on the much-admired Swing V-Tech chassis from BPW, with IDC stability control and Diamond Standard wheel locks as standard. With an MTPLM not far south of 2000kg, any enhanced stability on tow will be welcome; although tugs capable of hauling the Clipper include the Land Rover Discovery, plus comparable 4x4s and SUVs – all vehicles with considerable towing ability. Constructed using the proprietary SoLiD (strong, light, dry) technology introduced by Elddis in 2012, the Clipper sports single-piece GRP-coated silver sides. This surface allows scratches and dings to be repaired easily, while SoLiD is acknowledged to be one of the best of the new-generation bodyshell-construction techniques introduced in recent years by UK manufacturers. Like all Buccaneer models, the Clipper is fitted with an automatic levelling system by E&P Hydraulics. Operated from a control panel next to the entrance door, the system uses modified corner steadies and a pair of axle jacks to level the van in two minutes, so there’s no need for a steady winder or cordless electric drill. Once level, all connections are easy to access. The gas locker is at the front of the van, and the fairing even has a light to aid night-time hitching. Offside connections comprise the water inlet, external shower point, battery box and toilet cassette hatch. On the nearside, an external gas barbecue point sits just in front of a hatch to access the lounge’s underseat storage. Up above, a 100W Truma solar panel sits on the roof. Inside, on the left-hand side of the one-piece door, are the master switch, water pump and controls for the Alde underfloor heating (which can also be controlled remotely via a smartphone). The electrical master control unit is located under the offside lounge seat and includes a load limiter so you won’t have to worry about tripping your electrics. With around eight feet (2.44m) of width to play with, Buccaneer buyers have room to stretch out and relax in their lounges. These all feature parallel sofas around a centre chest with three front windows, two side windows and a transverse sunroof. The new Clipper has the same interior look as last year’s Buccaneers. Mid-toned wood-grain cabinetwork complements cream and beige upholstery. The latter uses Ozio squabs and seat backs, which are 30% lighter than traditional foam or sprung construction. The comfortable lounge seats have a slot-in restraint at the end of the nearside seat bench, and four scatter cushions that match the curtain fabric. Cassette blinds are fitted to all windows: it’s worth noting that the privacy glass used for the side windows reduces the amount of light entering the lounge. This won’t be an issue on gloomy days, though, because four directional LED spotlights above the seats are supported by mood lighting around the sunroof surround, which itself features four LED task lights. A pair of speakers is located near the intersection of the overhead lockers and the front wall of the van – these are opposite each other, but sound would be better projected if they faced rearwards towards the lounge. A USB point for portable electronic devices is provided on the front shelf. Drop-in carpets throughout the van have a substantial pile and can easily be removed. A folding-leaf table stows in a cupboard to the left of the drawers in the kitchen, and can quickly be deployed at mealtimes. The centre chest’s worktop extends into the lounge for drinks and snacks. Another area where the generous width of the Clipper has been well exploited is the midships galley. There’s plenty of room for people to pass each other, and cooks will appreciate the space around them as they prepare food or tackle the washing-up. The offside kitchen is arranged in an L-shape, the foot of which is created by a semi-circular cupboard at the end of the lounge. This cupboard fits around the profile of an externally accessed storage compartment, and neatly demarcates the lounge and kitchen areas. Open the semi- circular door to reveal three lipped shelves nestling under the substantial worktop. A rectangular sink is sited to the right of the circular cupboard. With a granite-effect moulding and smart chrome- finish mixer tap in its rear left corner, it looks very upmarket. Adjacent to the sink is a dual- fuel hob with three gas rings and an electric hotplate, plus a separate oven and grill beneath. A microwave oven on the other side of the van rounds off the cooking equipment; it’s mounted at head height above a large fridge with separate freezer. If other electrical devices are required, the pair of 230V sockets at the left-hand edge of the offside kitchen unit will prove handy. A sliding door in the offside corner gives access to the roomy and well-equipped washroom. Inside is a Thetford cassette toilet, next to a central heating radiator and a well-positioned toilet-roll holder. There’s plenty of legroom, so you won’t need to swivel the toilet. In the centre of the room sits a vanity unit with a square, grey, granite-effect basin on top, which matches the domestic-style tile-effect lining of the shower unit’s walls. A mixer tap fills the sink from the right-hand side. Above the basin is a half-length mirror and you’ll also find an LED task light and toothbrush holders. The shower compartment has a bi-fold door hinged on the right-hand side, with an Ecocamel Orbit showerhead opposite in the nearside corner; its mixer tap is at waist height. A drying rail for wet towels is included. There’s no rooflight in the shower compartment to let steam escape (this is outside, above the vanity unit), but there is a task light. The new bed configuration transforms the interior space. Two improvements have been made: moving each bed through 90°, and making them retractable, which creates 40cm of extra floor space. With both beds having a shorter ‘day’ position – retracted and with a ‘filler’ cushion removed – there’s plenty of clearance at the foot of them to access the washroom, the entrance of which is now in the offside corner. At a stroke, this reduces one of the disadvantages of transverse beds: they’re often tight to a side wall. Some may argue that a fixed bed that needs to be adjusted twice a day isn’t a fixed bed at all but, given the space these retractable beds provide, we think this is an acceptable compromise. The new configuration will improve comfort, as there are no walls hemming in one side of the beds. Each bed extends via a handle in the bed frame; when at their full extent, the filler cushion drops into the space to make up the length. Both beds have high- quality illuminated headboards (which come at the expense of a nearside bedroom window, although a rooflight between the beds helps make up for it) and there’s a chest of drawers in between for spectacles and so on. A half-length mirror hangs from the washroom wall; a folding partition closes off the bedroom from the front of the van, so one can dress here rather than in the washroom. A counter at the foot of the bed nearest to the lounge will accommodate a TV, and the necessary connections are provided at the top of the kitchen bulkhead. The lounge sofas could be used as single beds for children or teenagers, or made into a spacious double by pulling slats out from the centre chest and rearranging the seat cushions. The bed sizes are: front double bed 2.14 x 1.44m (front singles 0.7 x 1.81m); rear twin single beds 1.97 x 0.7m. Given the Clipper’s 159kg payload, you’d expect a variety of storage solutions. Choose from four overhead lockers in the lounge, four in the kitchen and two in the bedroom. Articulated handles are fitted to all overhead lockers, matching the chrome detailing of the locker faces. The three-quarter length wardrobe, above three drawers, is located next to the beds. The bed nearest to the kitchen also offers storage; its opposite number houses the onboard 40-litre fresh-water tank. In addition to the kitchen’s circular storage unit there are three drawers, beneath the sink. These secure with positive catches. Pans share storage space with the gas taps beneath the oven. The space under the lounge’s nearside seat box can be accessed from the outside; that opposite contains heating and electrical equipment. On the offside you’ll find an external storage locker, just to the right of the kitchen window. This is deep and will be ideal for outdoor equipment that you don’t want to bring into the van. A premium product that’ll be right at home on a seasonal pitch, the Buccaneer Clipper is stuffed to the gunwales with desirable equipment. The new eye-catching rear-beds configuration is certainly a unique selling point and improves the feeling of comfort in the rear of the van. 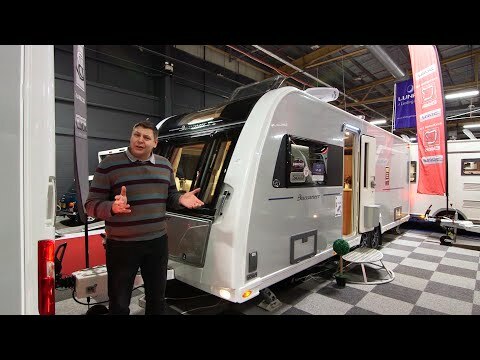 With an RRP of just short of £31,000, this caravan will be out of reach of many buyers, though.